Superb birdwatching tour to Southern Morocco at the best time of year! From mid February to late March many birds are returning towards Europe and the beautiful Moroccan landscape comes into bloom, providing food and shelter for migrants. Add to this the local speciality species in the varied habitats of coast and river estuaries, the snow-capped Atlas Mountains, Hamada desert and lush oases and we should achieve a mouth-watering list of nearly 200 species. This holiday goes further than a simple birdwatching tour; the culture and history of the region will amaze you and the landscape will take your breath away. We use quality hotels with excellent cuisine, situated close to the best birding sites and we travel by air conditioned microbus with a professional local driver. In the desert areas we use comfortable 4x4 Land Cruisers for two full days of Avian adventures! 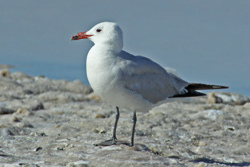 Morocco has bird specialities and near-endemics found only in the southern part of the Western Palearctic. Interesting species: Bald Ibis, Tristram's Warbler, Moussier's Redstart, Crimson-winged Finch, Red-rumped Wheatear, Thick-billed Lark, Hoopoe Lark, Levaillant's Woodpecker, Desert Lark, Bar-tailed Desert Lark, Fulvous Babbler, Cream-coloured Courser, Desert Wheatear, Maghreb Wheatear, Scrub Warbler, Temminck's Lark, Shore Lark, Desert Sparrow, Trumpeter Finch, Desert Eagle Owl, Crowned and Spotted Sandgrouse. Days 1 & 2: Arrive in Agadir in the early afternoon. Our target is to reach Tamri, on the coast north of Agadir, to search for Bald Ibis near one of the world's largest colonies. We also hope to see Audouin's Gull, Zitting Cisticola, Barbary Partridge, Moussier's Redstart and Spectacled Warbler. Settle into Hotel. Second day, we have an early start to Sous Massa National Park on the Atlantic Coast. Target birds: the secretive Black-crowned Tchagra, Marbled Duck, Ruddy Shelduck, Purple Heron, Little Bittern and Plain Martin. Later we visit the Oued Sous – an excellent area for Flamingos, Stone Curlew, shorebirds and large numbers of roosting gulls and terns. Days 3 & 4: After breakfast we will transfer from Agadir to Boumalne Dades. We pass through Argan trees, olive groves, orchards and will break for lunch near Ouarzazate, famous for its reservoir which is a magnet to migrating birds. If time allows we will have a sunset stroll on the Tagdilt track before dinner in our sumptuous hotel. After a good night's sleep, we will make an early morning visit to the famous and exciting Tagdilt Track, an excellent spot for some very special birds: Cream-coloured Courser, Black-bellied Sandgrouse, Thick-billed, Bar-tailed, Desert, Temminck's Horned and Hoopoe Larks, as well as Red-rumped and Desert Wheatears and Trumpeter Finch flocks. We will lunch in the village and during the afternoon explore the spectacular Dadés Gorge and search for Tristram’s Warblers and Black Wheatears. Maybe enjoying the spectacular view while sipping a mint tea! Days 5 - 7: First we visit a rocky canyon searching for Maghreb Wheatear, Desert Lark and our first chance of Pharaoh Eagle Owl. People live in caves here with flocks of sheep and goats. Next we travel eastwards and stop at a scrubby wadi to seek out the elusive Scrub Warblers; maybe also rewarded with Mousssier’s Redstart and Trumpeter Finches. Finally after another exciting stop we arrive at our desert Kasbah. Two full days in our comfortable 4x4 Landcruisers, exploring the desert. Our secluded Kasbah at Merzouga is situated right on the edge of the Sahara; with its attractive gardens and surrounding palm trees it attracts a good variety of migrants. We spend a whole day checking various sites around the edge of the red sand dunes of the Erg Chebbi - the largest dune system in Morocco. 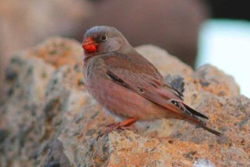 Our biggest prize should be found around the various Kasbah cafés that are dotted about the landscape - Desert Sparrow. Other species to search for include Fulvous Babbler, Hoopoe Lark, African Desert Warbler, Trumpeter Finch and Brown-necked Raven. Especial efforts will be made with our Nomad tracker to find the very rare Houbara Bustard plus Crowned and Spotted Sandgrouse. We may spend some time at dawn or dusk searching for Egyptian Nightjar. Day 8: Transfer day from Merzouga to Ouarzazate. Drive through the Anti-Atlas, a series of rocky hills, cliffs and deep gorges of volcanic formations. Roadside birding could produce migrants and plenty of wheatears. 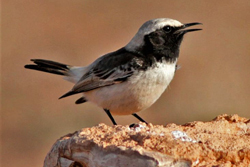 We will walk the shores of Ouarzazate Reservoir with an exquisite selection of birds, which may possibly include Osprey, White Storks, Spoonbill, Moussier's Redstart, Western Orphean Warbler and Desert Wheatear. Days 9 & 10: Journey from Ouarzazate to Marrakech. We will drive through the High Atlas Mountains, stopping at the scenic and impressive Tizi `n' Tichka Pass to admire its fabulous geological rock formations, before continuing on our journey towards the plains. We have discovered a raptor watchpoint where resident and migrant birds such as Lanner, Barbary Falcon, Lesser Kestrel, Black Kite, Long-legged Buzzard, Short-toed and Booted Eagles can all be observed gliding together below the clear blue Moroccan sky. 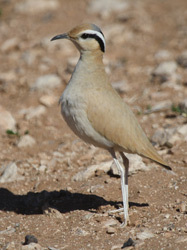 The road through the mountains is very winding and we will take our time, stopping at a few convenient hotspots where we hope to see exciting birds such as Levaillant´s Woodpecker, Maghreb Wheatear and Trumpeter Finch. On Day 10 we will drive up into the High Atlas Mountains and visit Oukaimeden (2600m). As we drive along the cultivated valley, we should find a good mix of resident and migrant species such as Woodchat Shrike, Common Crossbill, Hawfinch, Brambling, House, Rock and Cirl Buntings. Slightly higher up, among the rocky slopes, we will search for Blue Rock Thrush and the endemic Levaillant's Woodpecker. 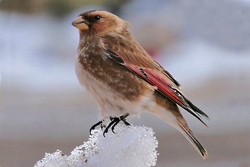 When we reach the ski resort at Oukaimeden, we will check the snowline for the handsome Crimson-winged Finch. Other species here include Rock Sparrow, Water Pipit, Alpine Accentor and Horned Lark. On this last evening there will be an optional visit to Marrakech Djemma El Fna Square which is an unbelievable experience for any visitor - snake charmers, water sellers and spice stalls plus the charm of bargaining in the Souk. At dusk we hope to see close-up views of a large colony of Little Swifts come in to roost. Day 11: After breakfast, depending on our flights, there could be time for some extra birding before returning to the airport. Includes: Easyjet flights (London Gatwick-Agadir; Marrakech–London Gatwick), accommodation (based on twin occupancy), meals, transportation in Morocco and services of leaders.